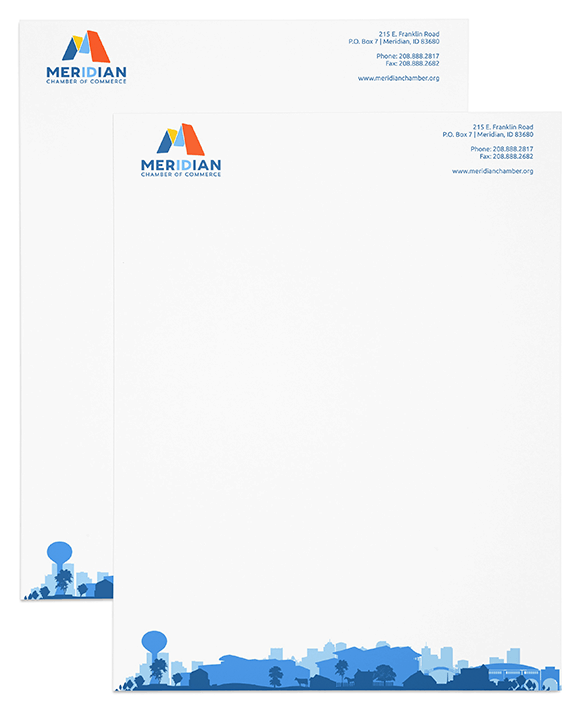 As part of their 5-year plan to align their public image with a more modern, streamlined vision for the future, the Meridian Chamber of Commerce in Meridian, Idaho selected Graphic Zen to help design their new brand identity. The previous logo had been in place for many years, and while it served its purpose, the decision was made not to evolve the current logo and instead create something totally new. One of the nice features that emerged from the concepts was the fact that we could highlight the "ID" in Meridian, to enhance the Chamber's location, so it would not be confused with other Meridian locations, such as Meridian, Mississippi. Additionally, the cityscape was developed as an additional graphic asset that can be used in addition to the new logo. The layers of this asset represent the agricultural past of the community, the middle layer reflects the present, and the lighter layer represents the future. The Meridian Chamber is absolutely delighted with our new logo and branding designed by Rudy Vaughn at Graphic Zen! The Chamber’s image was in desperate need of refreshing and updating. We wanted something bold, colorful and memorable to strongly represent our thriving Meridian business community. Rudy delivered more than we dreamed by adding a cityscape that represents Meridian’s past, present and future. We have had nothing but rave reviews for our new look. Thanks, Rudy, for your creative expertise and generous support. We’re off and running!